Q&A – So Tired After My Runs? Q: I am always tired after a run any longer then 45 min. To the point that i can’t seem to recover for the rest of the day, always feel like i can nap. And i never nap during the day. Any suggestions? Up your carbs? If I don’t eat enough carbs, I feel disconnected and sleep a lot. I eat freshly homemade guacamole after long runs. Seems to work wonders. Are you monitoring your heart rate during your runs? 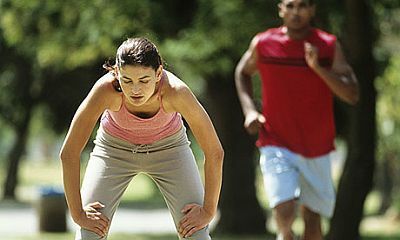 If so, pay attention to your avgs during the runs where you feel the most tired. It sounds like you may be running at an intensity where you’re depleting your glycogen stores and are not sufficiently replacing them post-workout. • I run better if I eat a banana 30 minutes before I run. • If 45 minutes is my long run for the week, I take a rest day the day prior. • Within an hour of finishing my run, I eat a snack that has protein and good carbs. • I make sure I drink plenty of water throughout the day after a run. If you really need a nap after a run, you are probably not getting enough sleep at night. Running takes a lot out of you. Try going to bed a half hour (or even an hour) earlier the night prior. Good luck – don’t get discouraged! If you do any kind of endurance sport, you absolutely need to replenish your electrolytes and such afterward (and during depending on how long the activity is lasting). Experiment with Gatorade, coconut water, GU, Clif shots and of course water—see what works the best for you, but definitely replenish. Recovery is an important part of exercising! There is a lot of good advice for you listed here. Pre run for me is coffee and peanut butter toast. Post run..banana and chocolate milk. You do sound like you are crashing. Check your blood sugar and iron levels. Go with what others said..you might need to fuel better, take care of hydration and also maybe lower pace a little untill you build up a really good endurance..more active mean more food.